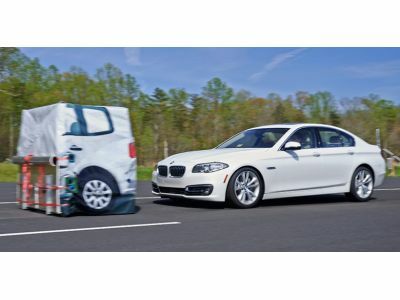 BMW leads way in crash avoidance system ratings | Atlantic Autowerks Ltd. The way to survive a crash is to avoid one altogether. You have a better chance of that when your car steps in and avoids the crash for you. In ratings released May 29, based on tests conducted by the Insurance Institute for Highway Safety, the BMW 5 Series large luxury car and the BMW X5 midsize luxury SUV were among four vehicles that when equipped with certain safety options earned perfect scores for front crash preventions. In all, eight vehicles, foreign and domestic, received "superior" ratings when equipped with sensors that not only warned of an impending crash but hit the brakes to prevent the crash or at least mitigate the damage. Crash avoidance systems are finding their way into a growing number of cars, primarily as options, and mostly in luxury vehicles. As they prove their value, however, they will eventually find their way into all models. For us at Atlantic Autowerks, it's good to see BMW leading the pack this year with a quality avoidance system. The tests conducted by the IIHS considered how well the autobrake worked when traveling at 12 mph and at 25 mph when confronted with a stopped "car" on the road. The car in this case was a mock-up of an auto's rear end made from foam and cloth, in case the auto brake didn't work well enough. BMW earned its perfect score with an improved front crash prevention system on 2014 models that utilizes both a camera and radar to detect slower or halted vehicles ahead and sets off a warning signal, pre-charges the brakes, and activates the brakes if the driver doesn't step on the brakes first. Not all the cars tested stopped in time, but the BMW models did, as did the 2015 Hyundai Genesis large luxury car and Mercedes-Benz E-Class large luxury car. Other cars receiving superior ratings slowed down enough to have received only minimal damage in an actual collision. We hear some people complain about modern cars continually getting more complicated. But a system that acts automatically to avoid a collision is a complication we can all live with.